The magazine began in the autumn of 1987 when Steve and Jean Cliffe were deeply involved in their campaign to save Staircase House and transform the old market place from its neglected and run down state. Both had given up their jobs to concentrate on establishing Stockport Heritage Group as the mouthpiece of a growing band of volunteer conservationists in the town, later to become a registered conservation charity, Stockport Heritage Trust. Steve had always wanted to edit his own magazine and now he found a reason to produce one. With money the couple had saved from their jobs, the first issue was published in November 1987. Within a year it enabled them to earn a modest living and carry on with their voluntary work. By selling the magazine to thousands of local readers it demonstrated that there really was a groundswell of interest in heritage and at the same time it was promoting enthusiasm for the heritage of our area. Editions in Winter, Spring, Summer and Autumn sold up to 6,500 copies each issue. Steve and Jean delivered the magazines to newsagents in the back of their old Datsun Sunny and edited it on a kitchen table. 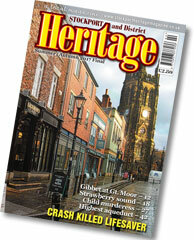 To date the magazine has consistently promoted the aims of Stockport Heritage Trust and sold thousands of copies, with three editions a year in Spring, Summer and Winter. Contributors, both local and expatriate, have poured in their stories and pictures. It has become a truly community publication – written by and for the people of Stockport and district. Sadly Jean died in 1997 but Steve continued to edit the magazine until the final issue.